Imagine, for a moment, that you could travel back in time to hear period music as it might have sounded to its original audience. 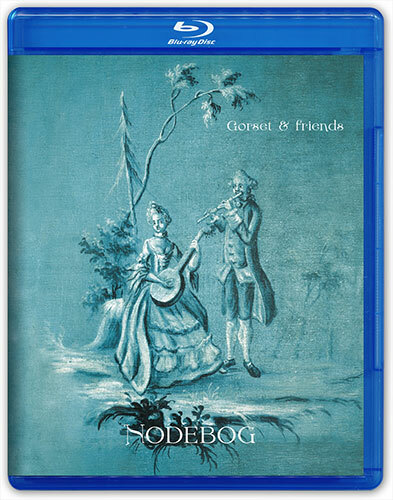 While that is not currently possible, the next best thing is to have access to a disc like Nodebog in which Norwegian Baroque specialist, recorder artist Hans Olav Gorset gathers some good “friends” for an evening of 18th century musical fare. “Nodebog” or notebook is a collection of 30 short pieces scored for a small ensemble of recorders and flutes (Gorset), baroque violin (Elizabeth Gaver), baroque guitar and theorbo (Vegard Lund), harpsichord (Lars Henrik Johansen), viola da gamba (Andre Lislevand), Norwegian folk drum (Kjell Tore Innervik), and percussion (Hakan Morch Stene). The four vocal pieces are sung by soprano Catherine Bothner-By. According to the liner notes by leader Gorset, these chamber works have a provenance that varies from Norway to France, England and Denmark. They are all sparsely scored with one player per part, allowing their musical textures to be crystal clear. Many of these pieces are dance forms of this era and would have been performed most likely in a large home or dedicated public space. While most selections will be new to today’s listeners, one in particular “Viole de Span” or La Folia has been one of the most popular pieces for theme and variations over the centuries. All of the 2L audio BDs that I have had the pleasure of reviewing have been blessed with wonderful sound but, so far, this one is about the best to come my way. The balances achieved in the Jar Church venue place the soloists clearly in one’s listening room with plenty of detail and airiness. Both 5.1 DTS-HD Master Audio and 2-channel LPCM at 192kHz/24-bits, originate from a 352.8kHz/24-bit DXD master. The multichannel version has better perspective and separation of the players. This is a two-disc set with an excellent multichannel hybrid SACD. There is the mShuttle Pure Audio option to play files on your computer. Group leader Gorset, as noted above, gives us a thorough and knowledgeable discussion of each work, including its original source. Although time travel is still a dream for the future, this BD recreates a parlor setting in 18th century Norway, less the expense of leasing a “time machine” or any concerns about safely making the return voyage home. It is difficult to overpraise the care taken to make this not only an authentic recreation of a delightful evening of music but one that bears repeated hearing. Audiophiles can rejoice as this is a demonstration disc that actually has great cuts that are worth listening to, imagine that! Thank you again, 2L.